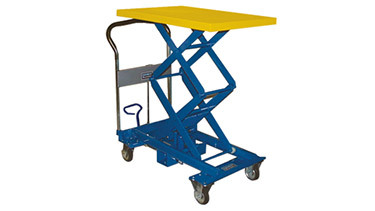 Mobile scissor lifts position loads at a convenient working height. 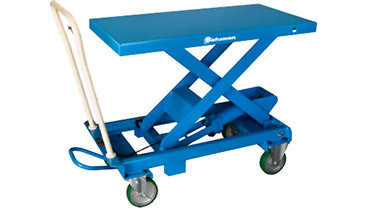 By minimizing undesirable lifting, reaching and stretching, these Bishamon and Southworth lifts increase productivity and decrease workplace injuries. 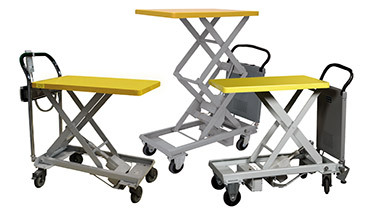 Mobile Work Carts are used in a wide variety of applications. From stocking shelves in retail stores to lifting and moving materials in libraries, pharmacies, machine shops and industrial manufacturing operations. 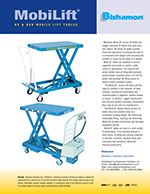 Heavy-duty construction with captured scissor rollers for maximum stability. 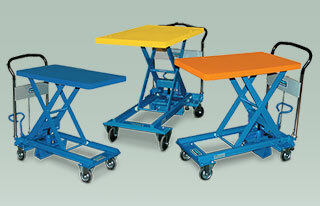 High quality casters and for wheels. Dual action caster brake locks both the wheel and the swivel. 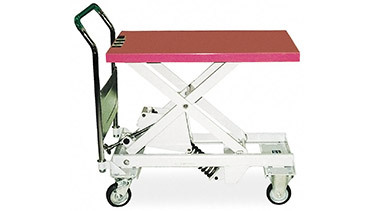 Convenient maintenance pins secure the scissor legs for inspection and maintenance. Quality baked enamel finish provides exceptional durability and corrosion resistance. BX-15 330 lbs. 20.4 in. 8.4 / 28.8 in. BX-25 660 lbs. 22.7 in. 11.3 / 34.1 in. BX-50 1,100 lbs. 22.1 in. 17.2 / 39.3 in. BX-75 1,760 lbs. 22.1 in. 17.2 / 39.3 in. BX-30S 660 lbs. 45.1 in. 17 / 62.1 in. BX-50S 1,100 lbs. 23 in. 16.5 / 39.5 in. BX-50W 1,100 lbs. 45.1 in. 17 / 62.1 in. BX-30B 660 lbs. 23.5 in. 11.5 / 35 in. BX-50B 1,100 lbs. 23.1 in. 17.2 / 40.4 in. BX-80B 1,760 lbs. 21.1 in. 17.2 / 38.4 in. BX-15WB 330 lbs. 39 in. 15.2 / 54.1 in. BX-30SB 660 lbs. 46.3 in. 17.5 / 63.8 in. BX-50WB 1,100 lbs. 46.1 in. 17.1 / 63.2 in. BXS-10 220 lbs. 20.4 in. 8.4 / 28.8 in. BXS-20 440 lbs. 22.7 in. 11.3 / 34.1 in. Low profile for use with skids, containers, or pallets. 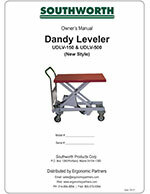 The Dandy Leveler which raises and lowers automatically as loads change. 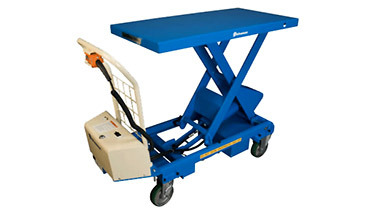 The Powered Dandy with push-button lifting and lowering. 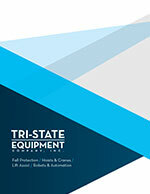 L Series manually handles capacities from 150 pounds to 550 pounds. 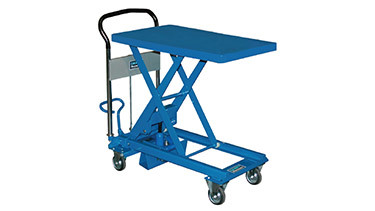 A Series manually handles capacities from 500 pounds to 1,760 pounds. DLV Series to handle automatically adjusting loads from 150 – 1,100 pounds. 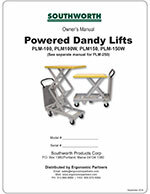 PLM Series is a powered unit to handle 220 pounds to 500 pounds capacities. L-150 330 lbs. 20.7 in. 8.3 / 29.0 in. L-250 550 lbs. 22.2 in. 9.5 / 31.8 in. A-500 1,100 lbs. 24.8 in. 11.8 / 36.6 in. A-800 1,760 lbs. 27.2 in. 13.0 / 40.2 in. A-350W 770 lbs. 36.2 in. 13.6 / 49.8 in. M-500L 1,100 lbs. 26.3 in. 3.2 / 29.5 in. PLM-100 220 lbs. 38 in. 13 / 51 in. PLM-100W 220 lbs. 38 in. 13 / 51 in. PLM-150 330 lbs. 18.5 in. 14.75 / 33.25 in. 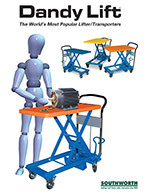 PLM-150W 330 lbs. 18.5 in. 14.75 / 33.25 in. 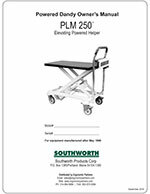 PLM-250 500 lbs. 18.25 in. 14.25 / 32.5 in. DLV-150 330 lbs. 15.25 in. 10.75 / 26 in. DLV-500 1,100 lbs. 16.5 in. 15 / 31.5 in. 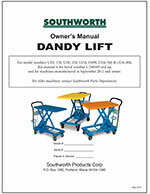 Ergonomic Partners is a distributor for Southworth and Bishamon mobile scissor lifts; serving clients from coast to coast, Canada, Mexico and especially focused in the states of Missouri, Illinois, Indiana, Kansas, Arkansas, Mississippi, Nebraska, Tennessee, Kentucky, Iowa, and Oklahoma.